It used to cost 299 baths for a 7-day pre-paid SIM by all 3 major mobile operators (AIS, DTAC and TrueMove H) in Thailand. Their plans are very similar and you may decide who to sign up by the queue size at their booths at airport’s arrival hall (choose the shortest queue, of course). 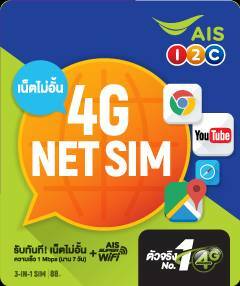 Not any more, AIS, the No 1 ranking operator, now offers a 4G Net Sim pre-paid SIM card at 88 bahts. In my opinion, it is the best tourist SIM card. It gives 7-day unlimited 4G mobile internet at speed up to 1mbps. Although 1mbps is not very fast today, it is good enough for casual use, like Whatsapp, Email, YouTube and web browsing. If you need to make local phone calls, you need to top-up at least 10 bahts or more. The calling rate is roughly 1 baht per minute for local calls, giving you 10-minute talk time for just 10 bahts. If you need to talk more on phone, you can top-up more anytime within its 30-day validity period. 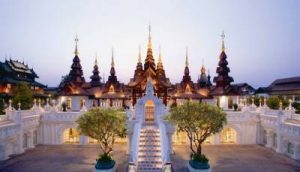 If you stay in Thailand more than 7 days, the weekly fee is 88 bahts. You can use the same SIM card by topping up or buy a new Net SIM at 88 bahts, if you prefer a new mobile number.